Our first impression of the Kiddy Urban Star 1 was that it was small, compact, easy to assemble and simple to fold. 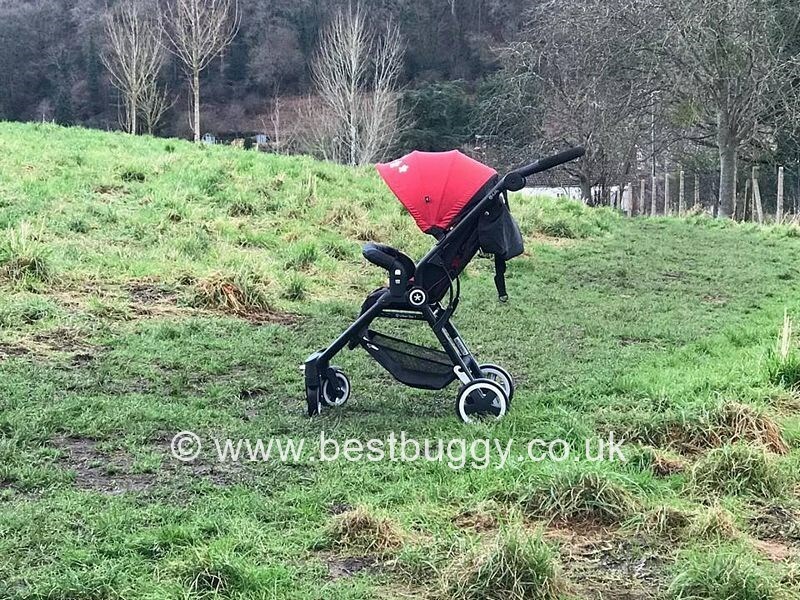 We were impressed by the materials and the additional unexpected extra of having a covered gate opening bumper bar, something not often found on such a compact pushchair. The wheels impressed us by being relatively chunky and sturdy for a small fold pushchair. This was especially noticable next to some of the other compact pushchairs that we currently have on review at BBHQ. The black seat with a splash of colour and the white rimmed wheels look very smart. The Kiddy Urban Star 1 seat is suitable from birth until approximately 3 years of age as the seat and foot rest, recline from a supportive upright position to a full lay flat position. The harness is fully adjustable, if not a bit fiddly to change, however it would have been lovely if it had an extra height position, as many similar buggies do, so that the harness sits above or on the shoulders of an older child. The seat has a full range of recline positions due to its easy one hand adjustable backrest. Whilst the seat has generous width proportions, it doesn’t have the highest or deepest of seats, however for such a small folding pushchair this is to be expected, the leg length however, does make up for it. The footrest has a choice of 2 positions to ensure your little one’s feet are well supported whether they are awake or sleeping. The footrest can be folded down to become a calf rest which gives clear access to a wide lower footrest for an older child. There is also the addition of a swing away bumper bar, which we loved, however it can be easily removed if not required. Air vents down the side of the seat will be brilliant to keep your little one cool in summer, or whilst abroad on holiday, but not so useful on a cold winter’s day in the United Kingdom. You could add a footmuff to keep your little one snuggly and warm. The Urban Star 1 harness is easily adjustable, has soft shoulder pads with the distinctive stylish star logo. The five-points of the harness stay together well making a 3-point harness upon release, making it easier to get your wriggly toddler back in again. The harness button is firm making it hard for a child to press in, but it is fine for an adult. Although the harness buckle feels cheap (and ours rattles), we do like the detail of the Kiddy star logo on the central button. The Urban Star 1 has a good sized, height adjustable and removable hood, which is great for babies and toddlers alike. The hood gives good protection from the sun, with four extendable positions although it would have been good if the hood had extended further at the front. Each position clicks into decisively into position. The hood fabric is a floppy lycra fabric which pulls taut when fully open. We are not huge fans of this fabric choice, but for this category of pushchair it is fine. The hood does lack any viewing window but this is not unusual on this type of small fold pushchair. We do like that there is fabric cover at the rear of the hood to cover a reclined child. There is a tri-star detail on the fabric cover, although, one of our star logos has begun to ‘bubble’ in the sun. There is no rain cover included and no option to purchase one that we could find, so this does make it more of a fair-weather buggy. We have no doubt that it would be easy enough to find a universal raincover cheaply on Ebay, so do not let this put you off. The fabric basket is generous and has elastic netted sides for easy access and is a good height below the seat. There is very clear access into the basket from the rear and also from the front, when the footrest is lifted up. There would be no problem putting a decent sized changing bag or rucksack in the basket along with some coats! The instructions give the impression that there is the option to add an infant carrier to this chassis by removing the bumper bar but we do not believe these will be made available. The rotating handlebar is covered in squashy foam padded and comfortable and has 2 height settings. The handlebar is a good height – very comfortable for me at 5ft 6ins. However it may be too high if you are of a shorter stature. The handlebar has another function – it locks the Urban Star open, and acts as the secondary lock when folding. The handlebar needs to be dropped right down to the floor in order to be able to fold the pushchair. With larger than average wheels for a compact fold pushchair; the addition of rear suspension; and swivel front wheels, the ride is smooth and the steerage is easy. The front wheels can be locked straight to help when going off road and they also swivel for manoeuvrability about town. We took the Urban Star 1 across grass, cobbles, country paths, pavements, up and down kerbs and it handled everything with ease. All the wheels are robust and made of PU, they pop off very easily to clean or for storage in the car boot. This is a definite bonus because the Urban Star is the sort of pushchair that is perfect for days out and holidays, when the boot is usually crammed full of other stuff. We LOVE the white wheel rims which just makes this pushchair stand out as being a little more luxurious. The independent brakes by each rear wheel are so easy to use and colour coded: red on the right hand side for on, green on the left hand side for off. The lack of a back axle means that if you have a long stride, you won’t be catching your toes. The Urban Star 1 has a simple 2 step one handed fold, simply rotate the handle to its lowest position (it should click when low enough but sometimes needs the handle squeezing inwards to release the fold), then lift up the fabric pull handle which is hidden behind a fabric flap in the centre of the seat, and the pushchair folds. The pushchair can fold with the seat left in any of the recline positions. There is a plastic locking catch which you need to apply manually once folded. We have found that the pushchair is great at staying closed if you don’t apply the catch. It will still stand nicely for example. Once folded the Urban Star 1 stands independently and neatly, however the bumper does protrude, and we would feel a need to remove it to further compact it when transporting it. Opening the Urban Star 1 is simple. Undo the fold lock; pull the seat back upwards until the pushchair is open onto 4 wheels; then rotate the handle upwards and you should hear an audible click as the chassis locks. 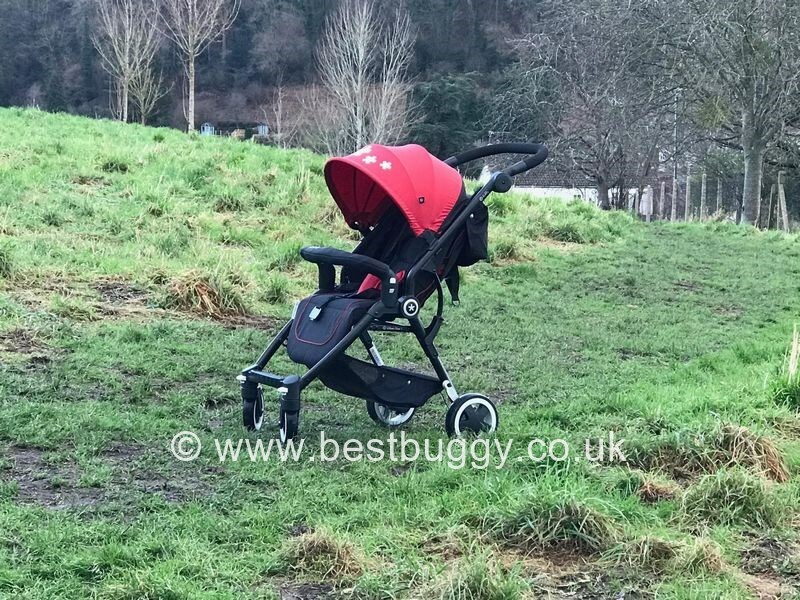 We were sold on the Kiddy Urban Star 1 as a from birth, lightweight compact fold buggy, perfect for holidays and outings. It isn’t top end luxury, but the fabrics are soft and the PU tyres ensure that it feels strong and robust and the styling makes this pushchair stand out from the crowd. The seat is generous, the hood is large although we would have liked it to be larger, and storage is easy to access. The push is smooth and the fold is easy. The only negatives for us is the harness height and lack of rain cover, but the latter is easily resolved. At a very reasonable £164 you get a lot of features for your money. We have awarded the Kiddy Urban Star 1 a Best Buggy 4 and a half Gold Star rating. We recommend that you take a look if you want a smaller folding or holiday buggy!